Horror as police storm plane amid BOMB SCARE at airport. The Briton, 48, and his friend were taken off the jet and arrested, before being thrown into questioning with officials. The Qatar Airways flight was reportedly already taxied on the runway before officials at the Ngurah Rai International Airport in Bali entered the jet to remove the pair. 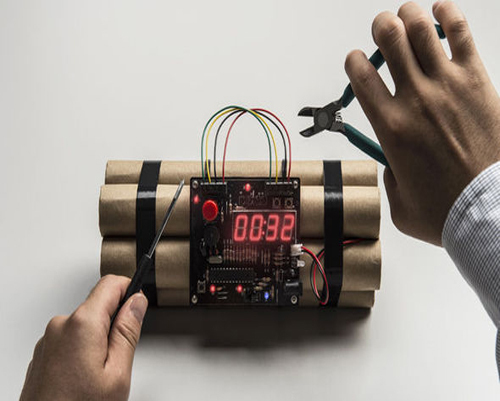 After interrogating the pair, police established the bomb, which featured a timer attacked to multiple sticks of dynamite, was a toy. The man claimed he intended to use it at a New Year’s Eve party and had already declared the toy before trying to board the Qatar Airways Flight. But when the airport general manager, Trikora Harjo, was told of the incident, he reportedly had the man pulled off the passenger jet. According to local media, security personnel finally cleared the man of any charges after being sent to a toy shop, where they found identical replicas for sale. Previous : Moscow on lockdown after home-made bomb detonates at bus stop. Next : ISIS-linked San Bernardino shooters had been radicalised ‘for some time,’ FBI says..